Ken Holland doesn't live in a cave, without access to the Internet or television, so the Detroit Red Wings general manager is aware of the talk circulating about star center Pavel Datsyuk. Some believe 34-year old Datsyuk might want to return to Russia and finish his career playing in the Kontinental Hockey League after his contract with the Red Wings runs out following the 2013-14 season. Datsyuk, who makes $6.7 million a year and will turn 35 on July 20, played in the KHL for CSKA Moscow during the lockout. He appeared to enjoy the experience greatly, which helped spark some of the speculation about where he'll play on his next contract. Holland, however, said he will likely wait until the end of this season to address the situation. "Obviously, I've heard the rumors," Holland told NHL.com. "I have not had any real conversation with [Datsyuk] or his agent, Gary Greenstein. Gary lives in California and I just saw him the other day. Basically we're going to sit down at the conclusion of this season, before Pav goes home. I don't know what will come out of it." 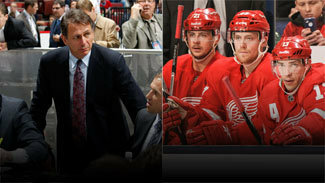 Red Wings fans are hoping a new contract is generated, and Holland also hopes that's the case. He just doesn't know if it's likely to happen at the moment. "We'll talk before he goes home sometime in June, but anything beyond that is speculation and rumors," Holland said. "Nobody's told me anything. They haven't told me they're staying or going. I haven't asked either. We hope he wants to stay, but I'm certainly aware there's a professional league in Russia and they pay their players well. Beyond that, I don't know." Datsyuk's fans in Detroit and Russia will simply have to wait as patiently as possible. Meanwhile, Datsyuk will continue being a puck magician for the Red Wings, who are currently in position to qualify for the Stanley Cup Playoffs for the 22nd straight season despite a slew of injuries. "It's going to take a while until we know anything [about Datsyuk's future]," Holland said. "And with the new [Collective Bargaining Agreement], we can't sign an extension until after [July 5]. We can talk, but can't do anything anyway." It's a different situation with Red Wings goalie Jimmy Howard, who will become an unrestricted free agent on July 5 if he and Holland can't reach an agreement on a contract extension before June 25, the date pending UFAs can begin meeting with potential new teams. Holland said he plans to reach a deal to keep 29-year-old Howard in the Motor City. "Hopefully between now and June 25 we'll get Jimmy Howard signed to a contract," Holland said. "Jimmy Howard is the No. 1 guy we want to build around and he now has three years of playoff experience." Holland signed 28-year old Jonas Gustavsson to a two-year, $3 million deal as a free agent last summer, but he's played six games while dealing with injuries and is seen as Howard's clear backup. "Jonas Gustavsson played tremendously in San Jose a couple weeks ago for a win and we like our bunch," Holland said. "But Jimmy Howard is the out-and-out No. 1." The future in Detroit is less certain, by varying degrees, for the Red Wings' other pending UFAs: Valtteri Filppula, Daniel Cleary, Damien Brunner, Drew Miller, Ian White and Kent Huskins.